Huntington Beach Instructor Certification Class with Chairman Bruce Gabrielson, Director Kim Hamrock and students. 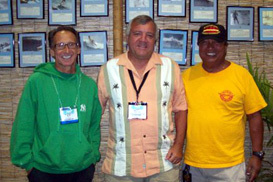 Orlando, Florida Surf Expo with directors and chairman, l. to r., Peter Pan, Bruce Gabrielson, Kali Montero Surf Sisters Surf School instructor giving a lesson in Tofino, Vancouver Island, British Columbia, Canada..
Bruce "Snake" Gabrielson started surfing in 1960. An active competitor for many years, he placed third in the 1971 US Surfing Championships, with additional placing at the ESA Easterns, the East Coast Surf Championships, and other US surfing championships in subsequent years. Taught to shape by Dale Velzy, he owned and operated Wave Trek Surfboards in the 1960s and 1970s in Huntington Beach, then re-opened Wave Trek in Chesapeake Beach in 2005. Founded US high school surfing and the first official high school surfing league while in Huntington Beach during the early 1970s. President of Huntington Beach Surfing Association for ten years plus directed the US Surfboard Championships for a number of years. Began teaching surfing privately during the 1970s, and continued helping with various schools and camps on a regular basis since that time. Did not become involved formally with Fenwick Island Surf School, a commercial surf school, until the late 1990s. 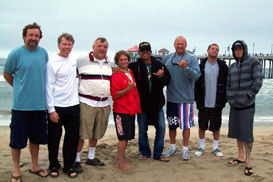 Founded his own commercial business, Snake's Surf School in 2003. Although he no longer teaches high school, Bruce currently holds formal secondary teaching credentials in Maryland and California. Ms. Kim Hamrock Kim "Dangerwoman" Hamrock is an extremely successful surfing competitor as well as being the owner and instructor at her surf school in Huntington Beach, CA, since 1995. She is a former Women's World Longboard Champion, an 11 Time US Champion, a 6 time West Coast Champion and a former East Coast Champion. She produced the instructional surfing video: "Safe Surfing with Danger Woman" (1996) and is a writer for the Wahine Magazine "Water Wisdom" column. Besides surfing magazines, she has been featured in Sports Illustrated and has appeared in several films as well as numerous radio interviews. Her Surf Instruction/Training activities include: the K-38 Rescue course to prepare for tow-in surfing, Lifeguard Certified, Surf Clinic for kids in Vera Cruz, Mexico, Surf Clinic All Girls Skate/Surf Jam, and the Cannon Beach Oregon all girls Surf Clinic. Hawaiian born, Kali 'da Big Kahuna' Montero surfing and instructional roots go back to the birthplace of surfing - HAWAII. Raised and first learning to surf on the West side of Oahu Kali first learned the ancient "ways" from his Kupuna in 1952 and surfed with some of Hawaii's legends and "first families of surfing". He later came under the tutelage of Duke Paoa Kahanamoku (father of modern day surfing) who instilled and commissioned him to the perpetuation of surfing as a Hawaiian heritage and gift to the world. Kali continued to learn and honed his craft from some of the legendary beach boys of Hawaii and spent 25 yrs. teaching thousands this ancient Sport of Kings on Waikiki Beach. Hungry to learn as much as he could about the sport he loved, Kali also studied under the Hawaiian masters of surfboard design and shaping and later was the East coast rep for Blue Hawaii Surfboards and Aloha Surfboards. Not satisfied he competed for 17 years specializing in big wave competition, which brought him to the international arenas of Hawaii, Australia and California and numerous other worldwide surfing venues. Having arrived in South Florida in 1996 Kali saw the need for a structured and expert course of surf instruction and with the blessings of owners of Island Water Sports co-founded what has become the largest and longest running organized FREE surf lessons in the world. Kali also founded an online forum which he hosts called Ask da Big Kahuna which provide expert advice and answers all questions about surfing, training, equipment, travel and accessories. Understanding the need for a more formalized course of instruction with individualized attention and from numerous requests from students, parents and the general public Kali established Big Kahuna Surf Schools to satisfy this need. Second generation San Diego, Californian, Gerry Kantor bodysurfed in the 1950's and started surfing in the early 60's. In the 70's he traveled extensively for surf in Mexico and France. In the 80's he wrote articles for Surfer Magazine and H20 magazine. He is a graduate of the University of California at San Diego, and has owned and operated Leucadia Surf School in north San Diego since 2003. Lou Maresca grew up and first surfed in the 60's in NJ. He attended the University of Bridgeport with a major of Phys Ed and an Elementary Ed minor. In 1999 he moved to Florida, subsequently settling in Vero Beach. He surfed ESA contests in the 1980s and was invited to the US Amateur Championships in Oahu where he placed 12th. In 1991 he opened Lou Maresca's Central Florida Surf School, know simply as Surf School, since there were no others on the East Coast at that time. By 1992 hundreds of students had attended his surf school and surf camps, including the Williams sisters, Venus and Serena...unknown at the time in the world of tennis, and with the first groups taken to his Costa Rican Surf Camp. In 1997 his school was the cover story in the Continental Airlines In-flight Magazine. In 1993, Lou directed and produced a local Florida TV show, "Let's Go Surfing!" In 1997, Men's Health Magazine attended Lou's Costa Rica camp and wrote a 5 page story about it. In 1999, Lou was hired by the US Dept. of Defense to instruct 2 personnel on how to teach surfing. Lou competed in the 2001 Robert August Invitational Longboard Contest in Tamarindo and took 1st. Lou currently lives in Vero Beach, Florida. Peter “Pan” Panagiotis has been teaching the sport of surfing at the Narragansett Town Beach, and up and down the east coast, since 1978. His surfing school handles all of the Girl Scouts of Rhode Island adventure camps, several YMCA programs in both Massachusetts and Rhode Island, as well as many private club and camp programs in the Northeastern US. A member of the East Coast Surfing Hall of Fame, he was the first surfer from New England to place at a professional surfing contest, and was the first New England surfer to be featured in a full length surfing film, when he appeared in “Going Surfing” in 1978. He has designed several surfboard models over the years. His “Peter Pan Slug” model surfboard, made by Hobie, has been their best selling board design for almost 30 years. Skip Savage is well known in the surfing world. He began his surfing career in 1964 and has surfed throughout the US, Costa Rica, Eleuthera and Hawaii. He is also an active competitor with several ESA State, District, Regional and ESA Easterns titles, plus finishing 2nd and 6th at the US Championships. A member of the East Coast Surfing Hall-of-Fame, Skip often appears in newspapers and surf magazines. His movie credits that include: “Waves of Reflections," "Paving the Wave," "Making the Mosta Costa," and "Surfing/life beyond the reservation," a video for Indian reservation children. Over the years Skip has not only worked for surf schools, but he has given tips, suggestions, etiquette and private instructions to various people from all over the world both professionally and non-professionally. He has a learn to surf video" A Question of Balance" due out soon, and was on the board of directors of the Delaware Seashore Preservation Foundation. Skip also worked as liaison between surfers and the Delaware State Parks system.